Again a little further today. Also for the first time when a whole swim without breathing in water. Progress! Nice work on the chin/pull ups dude! Great idea I must say lol. 7.5kg for 7 reps is good, don't shy away from adding more weight, you should be able to do +10kg for 4-5 reps for your first set no problem. Cheers bud! Certainly took on your suggestion with great effect. See below. Back on the bench mate great stuff! I may of asked but would you not rather go for a run as well as swim or would this kill yout sciatica? If the aussie sun didnt get you first! Yeah running fvcks my back. It’s the shock of each step. Swimming is best for it... zero impact and I’m straight as a rod. And cheers bud going to be working hard on bench. I may of asked but would you not rather go for a run as well as swim or would this kill yout sciatica? If the aussie sun didnt get you first! 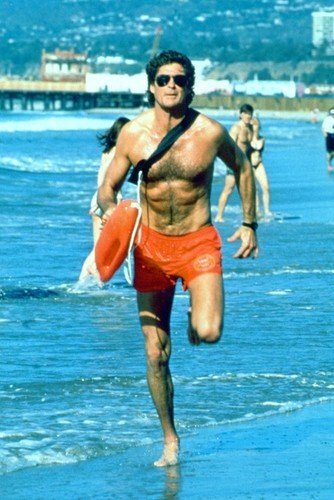 I always watched Baywatch for the intricate storylines and superb performances. I paid no attention to the seamless, red, skin tight swimsuits at all. He's also carrying some water weight! Good to see you're back on the benching mate. Cheers bud! Give it a few months and I’ll have matching water weight lol. Yeah each week I drown a little less so definitely progress in that front. Cycling isn’t great for me either as you are in bent over position. Not only does it hurt the back but I generally feel exposed and vulnerable lol. Quick update from yesterday’s training session. Sciatica got a little annoyed so I’ve started changing a few bits. Chins added 2.5kg for each set and still managed to get a rep up. Got a little side tracked chatting after so Rows were done well rested. Kneeling pulldowns are providing some sciatica feedback so I toyed with the bench trying to find a setup that works. Defeated, I gave up and went and gave the lever pulldown another go. Felt good in the upper back but once both sets were done sciatica felt much worse when standing. I think I’ll just switch this to the assisted pull-up next time. Seated rows went very well. Reverse flyes also up a notch. Preacher curls I decided this position is an accident waiting to happen so did last set with standing curls. Not pushing back raises today due to the pain, currently 50/50 about continuing these. Smashed some leg curls and calves out before signing off. A little longer today at 1:40hrs. Not a good trigger day by the looks of it, mate. Chatting in the gym .... coz that’s how gains are made! Yeah has been pretty bad of late. Changing things in the gym to accomodate. Lol if I was in your gym I bet you couldn’t resist either. In damage control a bit today. Sciatica quite bad. Hard to pinpoint if it’s because I’ve just started to push leg training, because of the shoulder presses the other week, or the odd angles I’ve been in lately working on the roof. Either way training in vulnerable positions certainly won’t help the healing process, so like a bad 80’s slasher I took to my routine. Decided to sack off DB bench after one set. Getting the weights in position leaves my back in a vulnerable position. Flat bench it’s pretty much there already. On my work day I’ll go for higher reps, on my off day I’ll do heavier sets for 5s. Have also kicked lever shoulder press as I’m concerned about the compression on discs here. Instead I did a few sets on the smith incline and added a set to the SLRs. Skulls added reps on all sets as did pec dec. Someone using the cable machine so onto pressdowns, which were blasted hard but no extra reps gained. Cable SLRs got rid of the 40lb set as it was too heavy. Instead focused on reps for the 30s. Kettlebells were ok going slow and not too deep. Single leg squats have taken a step back closer to the bench to make it more quad dominant. No more zercher squats. Finished with glute and ham stretching. I think that chins may be making my sciatica grumble a bit, mate. Rep progress has stalled this week and I think it's because my body is protecting the piriformis from being aggravated and pushing on the nerve. On the face of it, you'd have thought that chins wouldn't set it off. Sciatica flaring up again sorry to hear this mate it fcukin wrecks training when this happens. Any idea on what's caused it? Problem is as you know it can be something as stupid as sitting in the wrong position or slightly twisting that sets it off ,mine once went off just brushing my teeth FFS. Some piriformis stretches before chins would probably help that mate. Unless it’s a disc injury like mine. Chins have always been good with my back unless I get sloppy and start curling my legs up. Cheers bud for the suggestion though. My own fault really. I keep doing exercises I know I shouldn’t for the benefit of dem gainz. Keep saying I need to train smarter but I listen to myself less than anyone lol. Cheers pal. Hard to narrow down as you know but maybe a combination of all those I listed. Been working on posture in car and adding back pillow when sitting on chairs etc. is slowly helping. Just need to stop the aggravating exercises and keep up this posture stuff and it will come right. Seriously looking at some sport massage now too. Glad to see you're making the best of things and have a plan. That's some good mental strength in the face of adversity. Cheers pal! Not much else can be done with it. Plus it's my own stupid fault lol. Just for fun, and because we all love a graph, here is my total weight loss from my three month cut earlier this year. You can see I continued a downward trend during PCT, indicated by the blue vertical lines (not good) a fairly steep dip during a low calorie week (also not good), and now it is slowly moving upwards in a very slight surplus (good.) This past 7 days I have put on 0.3kg. I want to maintain this slight surplus for the next few months before ramping up come June when the fun begins. New week, new focus, new journal layout. Pullups bumped all sets by 2.5kg. An extra BW set in the warmup accounted for the loss in reps. Did the same with rows adding another set at the end. Feeling pretty strong today marching into each set with solid focus. Pulldowns added weight to that first set but chose reps for subsequent sets. Sciatica doing okay -very slight aggravation from pullups, rows and pulldowns but pretty much everything annoys it right now. I think as long as I’m not putting compressive or shear forces on the injury it should get better over time. Speaking of which one set of cable rows was enough to motivate me to find a way to get a chest support in. Managed to rig up a system using the cable machine, the downside of which I had to chain plates to the stack (see below.) Acutely aware I was running out of time now I smashed out drag curls which were up. Reverse flyes a little dip in reps on the two sets but squeezed in a third for kicks. A little cheeky today taking a bit too long with training in my lunch hour. 65 mins plus shower! Thought you'd appreciate that. Worked quite well so will keep it. Obviously the same plane of movement as the lying rows but different angle enough to warrant keeping. Brilliant innovation. All about the angles. I should really focus more on trying new angles to move the weight through. Have seen John Meadows preach about on numerous Insta posts. They do say necessity is the mother of all invention. Back and bi's. Like a true bro, Animal will be proud.